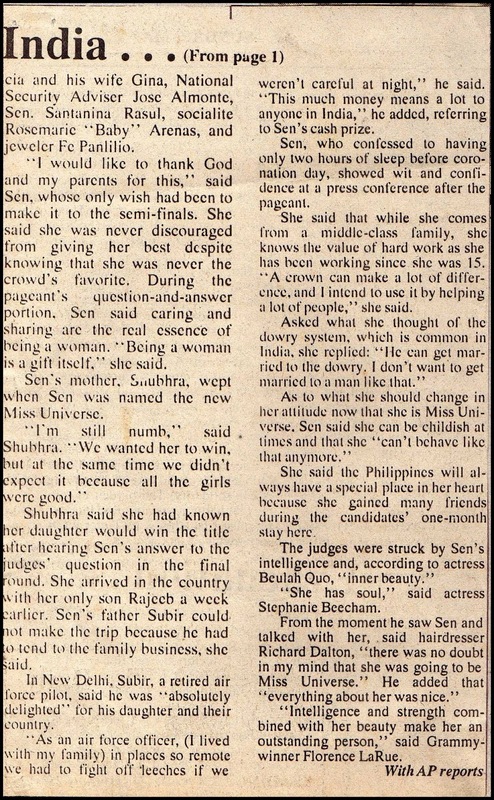 With her win, Sen became the first from India to be crowned Miss Universe. 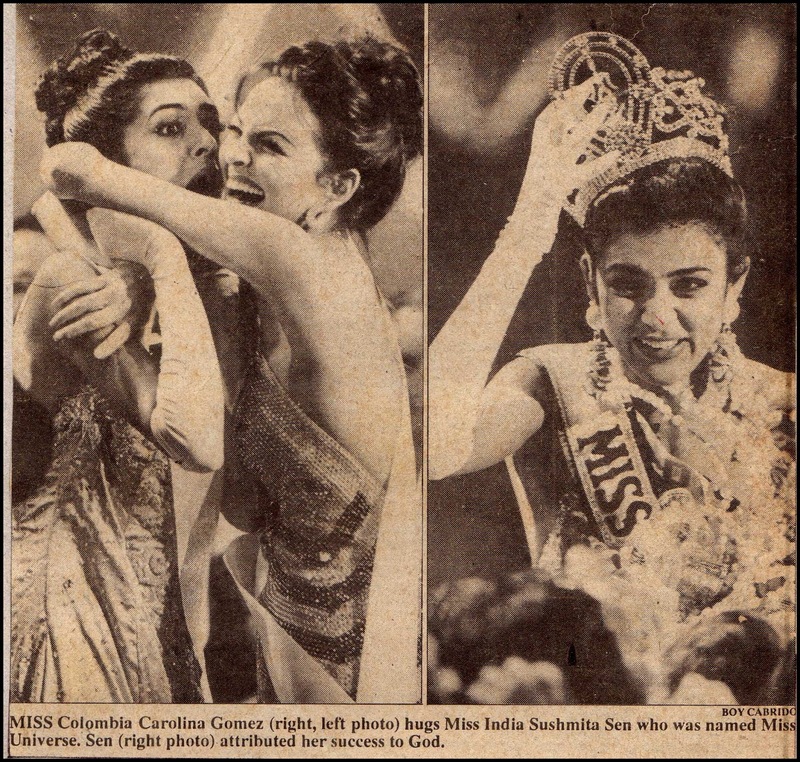 (Interestingly, another Indian, Aishwarya Rai was crowned Miss World in November that year). Carolina Gomez of Colombia and Minorka Mercado of Venezuela were first and second runners up, respectively. Charlene Gonzales of the Philippines, Lu Parker of the United States, and Silvia Lakatosova of Slovak Republic were among the other finalists. The event was carried by the Philippine television network ABS-CBN. 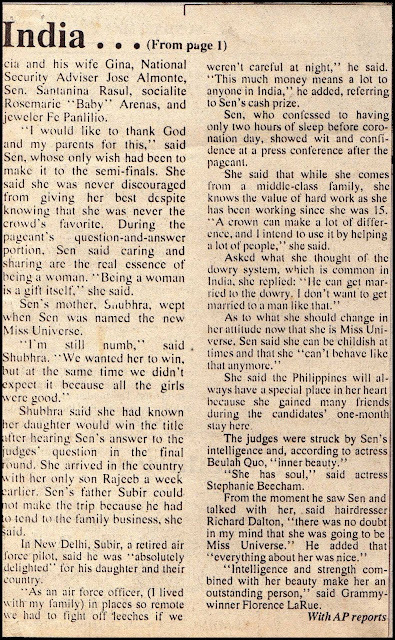 I remember this time and Charlene Gonzales was one of the strongest bets for Ms. Universe but it turned out that Sushmita Sen was the one who gave the best answer. wow going back in time. i still remeber this! hahaha i will show this to my sister! The essence of a woman... made her win! of course I won't ever forget that day...because it was my birthday!!! Love Sushmita! But I do hope that our Filipina contestants will soon carry the crown again.. Shamcey was so close! She is indeed a beauty and deserved to win .I watched the show on tv and was happy for her winning the crown. I was 4 years old back then, but i've read some posts about her. 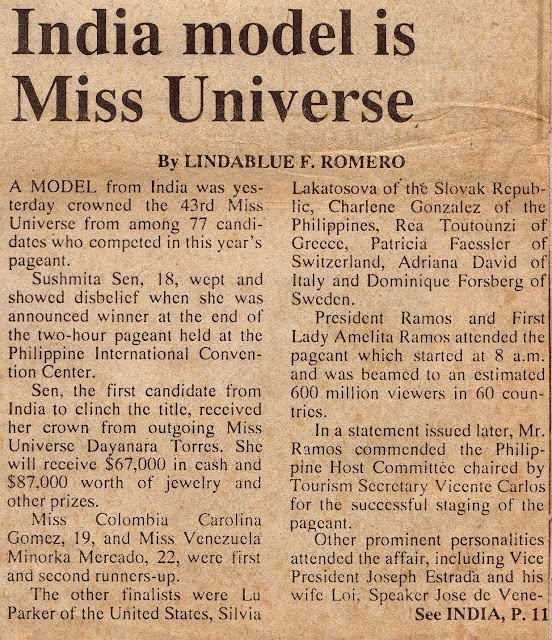 This is indeed a pageant history. While Asian beauties have been claiming posts in the international competitions, Philippines have got a lot of great women in the well-craved list already. ooh, she's a beauty but i do love Aishwarya Rai more. she's beautiful! where is she now? 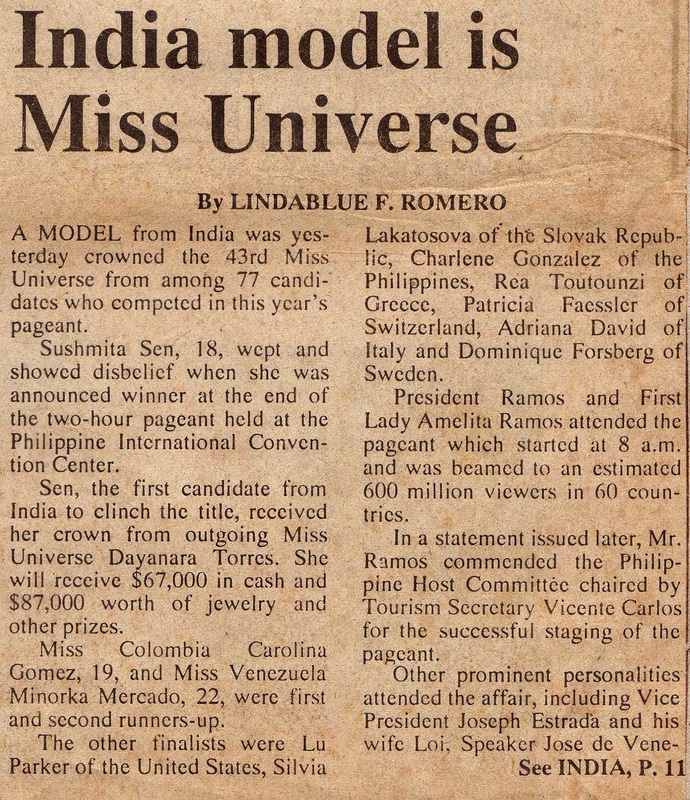 "In 2010, she ventured into partnership with Tantra Entertainment Private limited becoming the President of the 'I Am She' Miss Universe Contest and the sole representative of the Miss Universe pageant in India." I love her to the bones. Its just sad, I lost track of her na.. I saw the live telecast of the pageant over ABS CBN. She was my favorite candidate. I saw this at ABS-CBN, I love her.